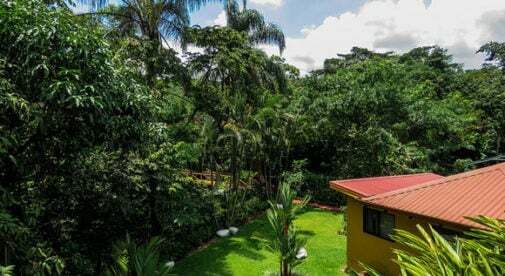 Part of the reason my wife and I chose to begin our Costa Rican adventure in the Central Valley town of Grecia was its proximity to San José and the airport, as well as the beautiful scenery and temperate climate. That was over three years ago, and we still haven’t left, and not just because of the reasons above. We stayed because of the great community, the low cost of living, and the excellent healthcare available directly in town. 1. We live at an elevation of 4,700 feet, about eight miles up from downtown Grecia. At this elevation the temperatures range from 60 F to 80 F year-round. This means there is no need for heating or cooling, keeping our electric bill low—about $40 a month for a three-bedroom, two-bathroom home. 2. Next is transportation. We don’t own a car and the bus system is excellent in Grecia. It is reliable, extensive, and inexpensive. Since we live high on a mountain ridge we have to take a bus into town in order to travel to the airport or capital. Fortunately, our bus comes by every hour, on the hour. Compared to owning a vehicle, using the bus system is very affordable. A bus from Grecia to San José is about $2 each way. From there you can get to anywhere in the country, and to Panama and Nicaragua as well. We recently took a trip from San José to Tamarindo on the bus that cost $20 each for a round trip. 3. Finally, Grecia is a farming town. Because of this, produce in the town is extremely affordable. Each weekend is our local feria or farmers’ market, where locals sell fresh fruits, vegetables, and meats at low prices. For example, three pineapples will cost $2, while 2lbs of potatoes is $1.50. It is not just consumable items and transportation that is inexpensive in Grecia either. Medical care is affordable and of a high quality. Many local physicians, dentists, and other healthcare professionals receive their education or training in the U.S. In fact, we have found that medical care here rivals that of the U.S., with two areas where medical staff in Grecia have exceeded our expectations—cost and speed of results. In our three years here we have had our teeth cleaned ($60), fillings replaced ($40), and our eyes examined ($10). Recently, my wife was having an issue that we needed to have checked out. We went to our doctor, who is a general practitioner. We had an initial consultation and a full physical exam. This cost $50 and included two additional follow up visits. He wanted a full blood work panel done, which cost $75. We went to lunch and by the time we had finished the results were ready for the doctor to look at. After reading the results, our doctor wanted to do one more test so we scheduled an ultrasound with another lab for the next day. The cost of the ultrasound was about $100 and once again, the results were immediately ready and the doctor was able to give us feedback quickly. Grecia is perfect for us. We can have beautiful weather, wonderful views, and excellent and affordable healthcare, all while staying within our budget.